There are over 12,000 species of ants in the world, but only a small portion of them find their way into our Andover, MN homes in search of something tasty like sweet fruits and candy or greasy foods. Ant problems within your home can be either seasonal or a year-round problem. Ants are very small, so they are able to find thousands of tiny doorways into your house. If you see one ant, you can pretty much guarantee that there are over 300,000 more somewhere within your home. It is important to seek help as quickly as you can before the ants’ population grows to an unmanageable number. Ecotech can eliminate your ant infestation problem quickly, we are an organic pest control company who offers environmental friendly pest control services. Not only is it safer on the environment, but it is safer for your kids and pets as well. In addition to the annoyance of an ant infestation, they can also pose some risks. The most common is that ants could cause disease as they contaminate your food. And if you have carpenter ants, seek professional help quickly, as this kind is insistent on destroying the wood that holds up your house. Although ants do have environmental qualities, they are still a nuisance if they get into our homes. Attempting to control and prevent them from getting to your food is a better idea than trying to completely eliminate them and environmentally friendly approaches are best for this purpose. Ant Problem? Let The Professionals at EcoTech Fix It. 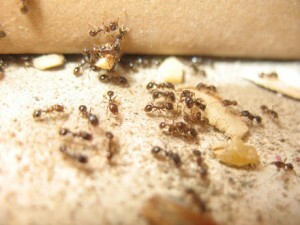 A lot of the time do-it-yourself pest control efforts for ants generally challenge most homeowners, so they often get frustrated and give up. Since ants can be very difficult problem to handle, it is best to leave it to the professionals to take care of your pest problem. If you have any questions about Ant or any other pest control services, call EcoTech at 763-785-1414 today!